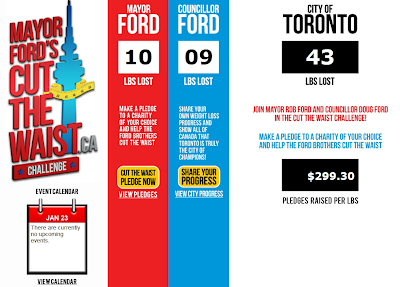 Toronto Mayor Rob Ford, and his City Councilman brother Doug, have gone on a very public diet. They've challenged other politicians and the general public to "Cut the Waist", and they've received a tremendous amount of media attention. Yesterday was their first weigh-in. The Mayor lost 10lbs in a week, and his brother Doug, 9. "Running a lot, lifting weights and eating like a rabbit." It's the classic diet plan. Under-eat and over-exercise and lose in a great big hurry. Of course if that approach to weight management were useful, the world would be a much lighter place and I'd be doing something else for a living. I mean who hasn't tried that at least once? There'd also be a great many fewer gallbladders as weight loss that rapid markedly increases the risk of gallstone formation. We'd also be a heck of a lot weaker as rapid weight loss leads to disproportionate losses of muscle, which is why, when folks do go on extreme diets and lose rapidly, when they can no longer live a life of suffering and head back simply to their old lifestyles, they have a tendency to gain back more than they lost. In this case the sadder story is the fact that their efforts are being broadcast to a nation, and rather than actually serve a valuable role models to a thoughtful and sustainable approach to healthy living, instead they're championing the same old stupidity that has plagued traumatic dieters for centuries. Suffering. Willpower. Crazy amounts of sweat. And I'm guessing their fair share of salads and grilled boneless, skinless chicken breasts. I don't wish ill on their efforts, but if someone's taking book odds on their weights two years from now, if this is how they're planning on losing it, I'd like to put my money on heavier than day one of their challenge.